The Poor Law Act of 1535 decrees that “the poor and impotent” should be supported by charity raised locally. This was the beginning of taxation to support the poor. Bedlam Hospital is opened – the ﬁrst formal “institution” for disabled people in England. Vagrancy Act enabled detention of people experiencing mental distress. The Industrial Revolution in Britain – Increases factory based work segregates disabled people unable to work. The spread of poverty in cities leads to increases in institutions, asylums and workhouses to keep the “economically unproductive” off the streets. First pressure group to defend the liberty of people in asylums formed. The National League of the Blind and Disabled is established as a trade union. The Royal National Institute for the Blind (RNIB) formed. This marks the beginning of modern charitable organisations, established “for” disabled people by philanthropists or parents and carers. Royal Commission on the Blind and Deaf: the ﬁrst ofﬁcial recognition that national government should act on poverty amongst disabled people. Blind Persons Act: Unions of disabled war veterans are formed and blind workers march on London, against poor pay and conditions; this results in the ﬁrst legislation passed, introduced and supported by disabled people. Disabled Persons Employment Act introduces the ﬁrst legal deﬁnition of a disabled person. The National Health Service Act and the National Assistance Act passed: The Labour Government constructs the “welfare state” with the introduction of the National Health Service and the National Insurance Scheme. The welfare state marks the end of the “deserving poor‟ charitable approach to disabled people, but the philosophy continues. SCOPE) establish residential homes for disabled people. The All Party Disablement Group set up by Jack Ashley, a profoundly deaf MP. Chronically Sick and Disabled Persons Bill became an Act of Parliament passed. Paul Hunt a disabled activist writes a letter to The Guardian newspaper calling for equality for disabled people. His letter inspires the start of a united struggle against discrimination. Morris became the ﬁrst Minister for the Disabled anywhere in the world. UPIAS publish “Fundamental Principles of Disability‟ outlining the Social Model. Sisters against Disablement is founded by disabled feminists. British Council of Disabled People (BCODP) is established as an umbrella body that supports and encourages the development of hundreds of new organisations controlled by disabled people across the UK during the 1980s. The Commission of Restrictions Against Disabled People (CORAD) begins the campaign for civil rights legislation that culminated in the Disability Discrimination Act. There were 17 attempts made to introduce comprehensive and enforceable civil rights for disabled people. The ﬁrst Black Disabled People’s Network and several black mental health users groups are founded. 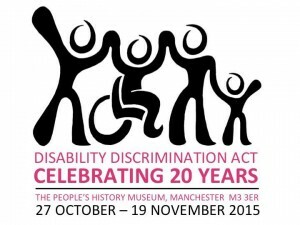 Campaign for Accessible Transport (CAT) is one of the ﬁrst disabled people’s groups to use direct action. Regard is founded to challenge homophobia in the disabled people’s movement and the exclusion of disabled people from the Lesbian, Gay, Bisexual and Transgender community. Disabled people’s Disability Action Network (DAN) are formed carrying out over 100 protest actions in the next 5 years. After years of campaigning by disability activists, the Conservative Government introduces legislation to outlaw discrimination against disabled people. The DDA amendment act: extends anti-discrimination protection to land transport, small employers and private clubs, extends the deﬁnition of disability and introduces a public duty to promote disabled people’s equality and “involve” disabled people. The UK Government ratiﬁes the United Nations Convention on the Rights of people with disabilities and passes the Single Equality Act: Much has yet to happen to make these Rights a daily reality for the 12 million disabled children and adults in the UK.